Quick cocking version with shutter coupled to film advance. 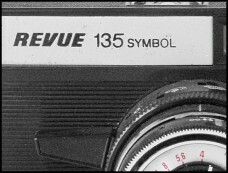 Symbols repeated on black lens barrel. Reduced size viewfinder displaced to allow a rewind crank. Film speed memo on camera back . Original price (in year 1986) 20 roubles. PK3743 - Smena Symbol (without serial number). PK3705. 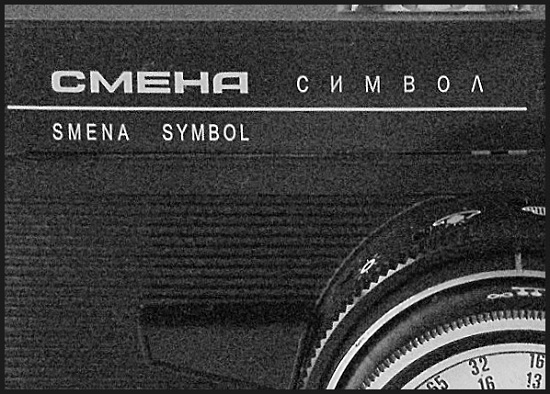 An original Smena Symbol was announced in early seventies. The top plate and bottom plate are made from metal, not plastic yet. Was seen in pictures with black or white lenses. An internal accessory shoe. An ultra rare to find nowadays. 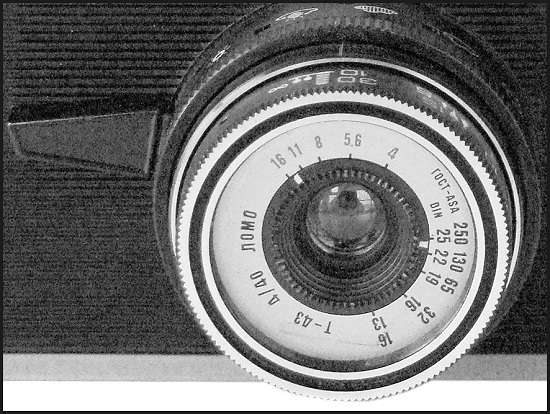 Camera opposite from Alain/Claire Berry (France) collection. 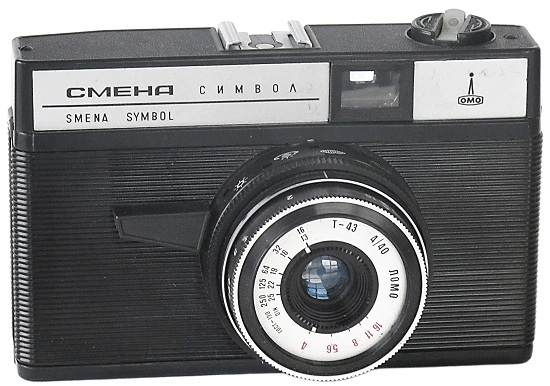 PK3705 - Smena Symbol prototype camera. PK3707. Symbol becoming totally plastic already. Top and bottom plates in light-gray. 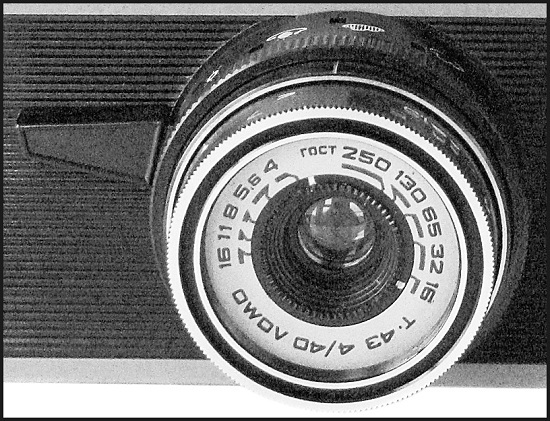 Old design of T-43 lens. Internal accessory shoe as on prototype PK3705 camera. 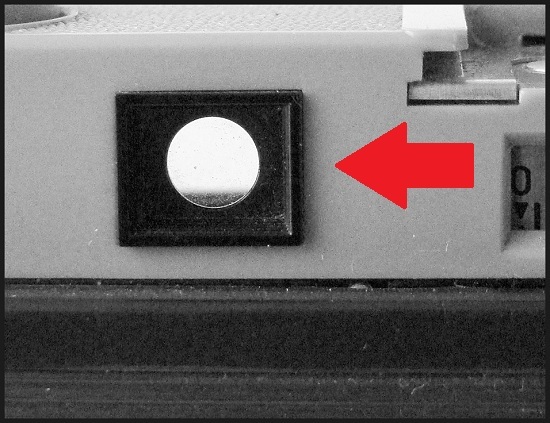 Round viewfinder's window on the rear plate (see picture below). Single name markings. Very few pilot samples released in 1971. Still ultra rare to find nowadays. Sample opposite from LOMO (Russia) archives. PK3707 - Smena Symbol pre-series camera. PK3710. 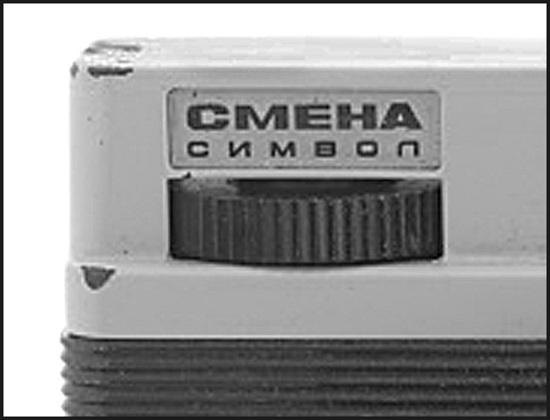 An early productional Smena Symbol is identical to PK3707, but with film winding lever already (winding knob on previous versions). 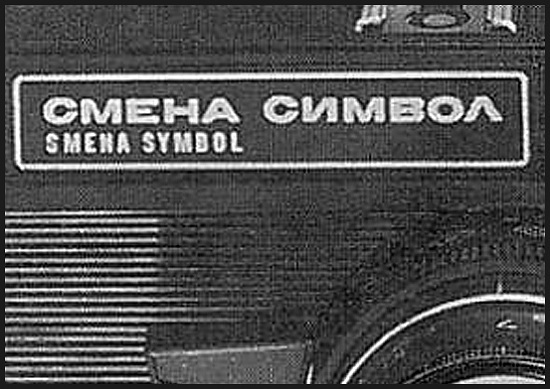 Single name markings in Cyrillic characters. Black characters and smaller size Lomo logotype on the white background. 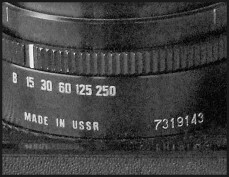 Old design of T-43 lens (see picture below). Sample opposite was scanned from soviet press (1971). 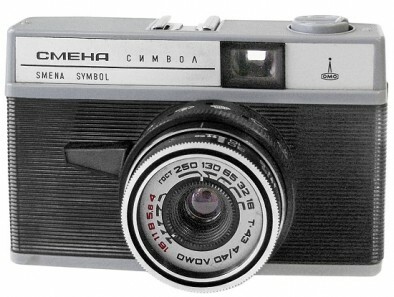 PK3710 - Smena Symbol camera. PK3715. Camera identical to PK3710, but with regular bilingual nameplate markings already. 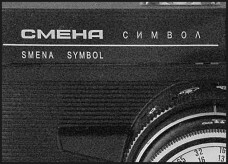 An earliest so far known regular version of Smena Symbol. Top plate and bottom plate in light-gray. Old design of T-43 lens. Internal accessory shoe as on prototype (preseries) versions (see picture below). 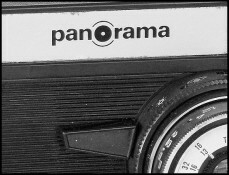 Round viewfinder's window on the rear plate. Very rare to find nowadays. An earliest so far known camera has s/n #710036 (SovietCams). PK3715 - Smena Symbol #710129. PK3717. Camera identical to PK3715, but totally black already (only the plastic on film winding lever is gray yet, see picture below). Very rare to find nowadays. Camera opposite from LOMO (Russia) museum. 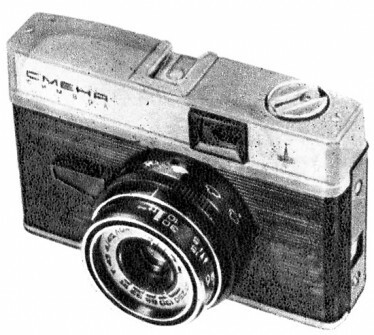 PK3717 - Smena Symbol #710137. PK3720. Gray version again. Camera identical to PK3715, but with an external accessory shoe already (see picture below). Viewfinder's window becoming rectangular already. Still old design of T-43 lens. Very uncommon to find nowadays. An earliest so far known camera has s/n #710448 (A.Zilbert coll.). 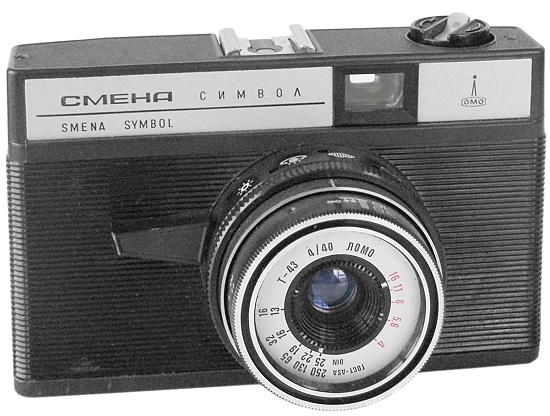 PK3720 - Smena Symbol #710557. PK3725. 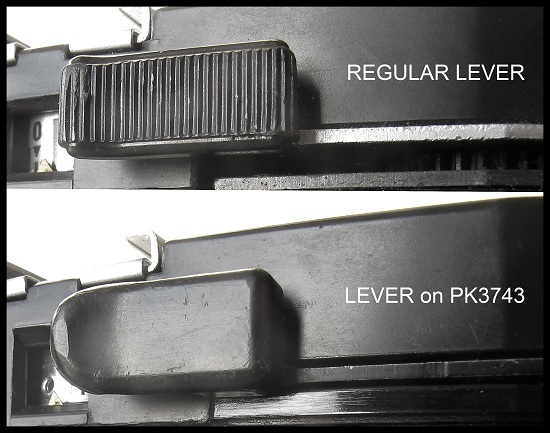 Camera identical to PK3720, but with regular lens design already (see picture below). Seems to be the latest version of gray Smena Symbol group. 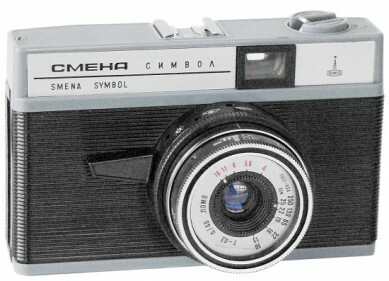 PK3725 - Smena Symbol #710640. PK3730. 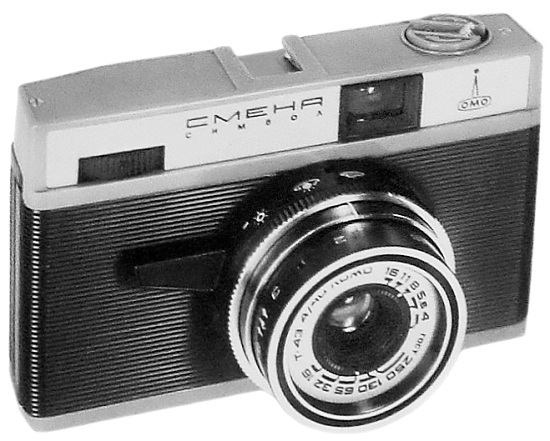 Quite common totally black version of the particular camera. Regular binary name (Cyrillic/Roman) and black logo on white background. 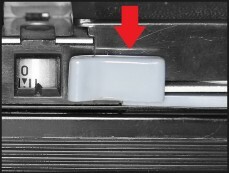 Serial numbers on the shutter housing yet (see picture below). PK3730 - Smena Symbol #7319143. PK3735. Very common version to find. Identical to PK3730, but with serial number stamped on the bottom plate already. 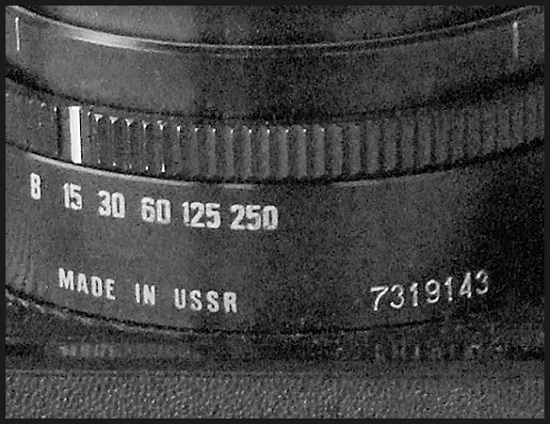 Soviet Sign of Quality under the shutter housing. Released by LOMO in huge quantities. PK3740. 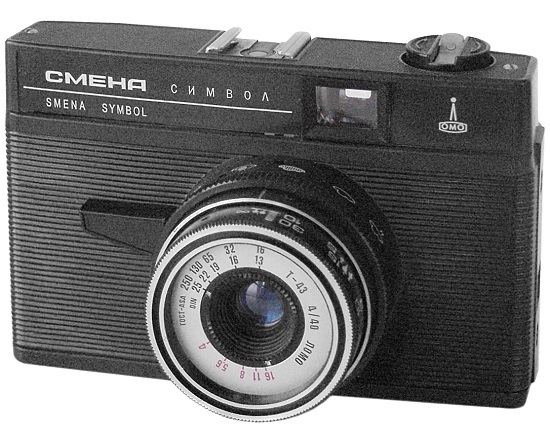 All Smena-Symbol cameras come with film memo disk on the rear plate. Although the big majority of Symbol cameras have gold-coloured markings on the memo disk, the latest examples come with white markings already. 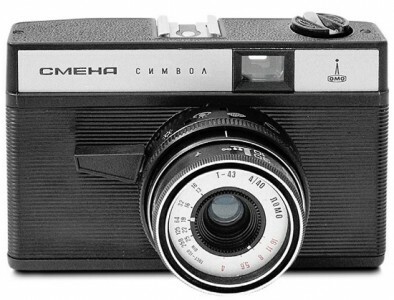 Investigated camera has s/n 90637255 (SovietCams). PK3735 - Smena Symbol #81001485. PK3743. Very interesting version of the particular camera. Slightly changed construction of the T-43 4/40 lens without foot scale markings already. New design of shutter advance lever (see picture below). 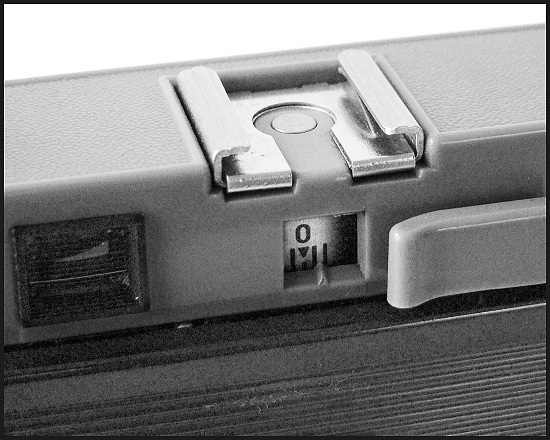 The particular camera has no serial number at all. PK3745. Seems to be the late and ultra rare version of particular camera. Binary name Smena Symbol and white logo on black background. Sample opposite scanned from soviet press (1991). 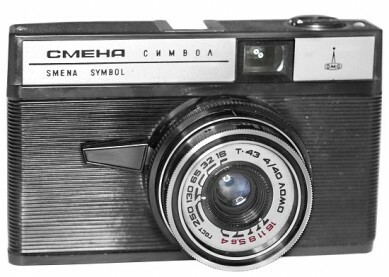 PK3745 - Smena Symbol camera. PK3750. These new-comers are quite popular nowadays. Old stock LOMO cameras fitted with new coloured faceplates (made inside the LOMO zavod under special request). Happened to see items with blue, red, green, etc. faceplate. 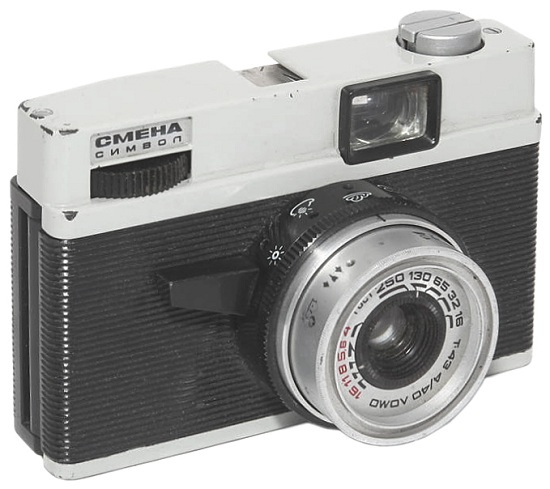 Because of Lomo origins these cameras could be considered as authentic LOMO cameras indeed. No otherwise different. 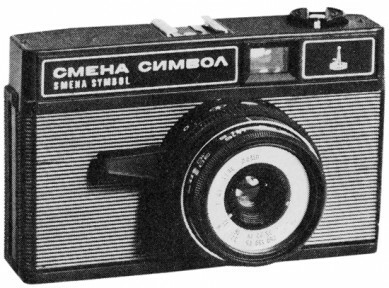 PK3750 - Smena Symbol #79643480. PK3755. Never seen before version of the particular camera. 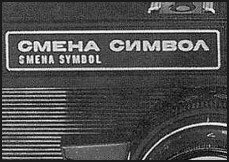 Single nameplate markings in black Cyrillic characters. No otherwise different from regular Symbols. Picture of Smena Symbol was kindly provided by the authors of SSK book "1200 Cameras from USSR". PK3755 - Smena Symbol camera. PK7360. Less common to find early version of export Symbol, under name "Cosmic Symbol". 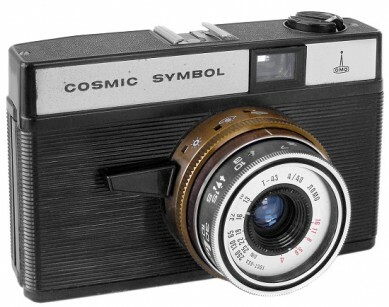 The big quantity of Cosmic Symbols were released for United Kingdom market, but very few of these cameras can be found with bronze-coloured lens (as on sample opposite). Serial numbers on the shutter housing. 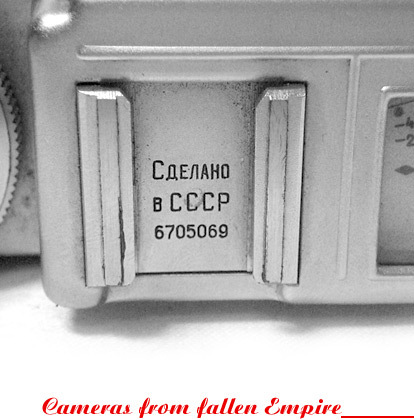 Another investigated camera #7431930 (SovietCams) has regular black lens. PK7365. Even more uncommon variation of the particular export camera. Under name "Cosmic Symbol" again. White name markings on black background, black logo on white background. Still bronze-coloured lens. 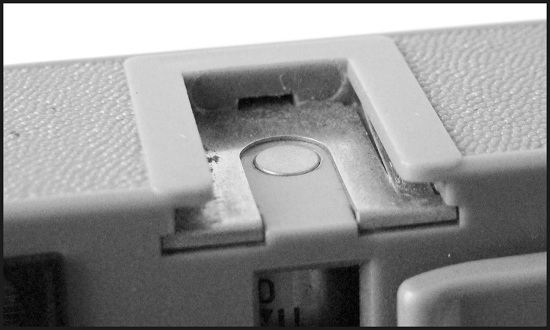 Serial numbers on the shutter housing. No otherwise different. PK7370. 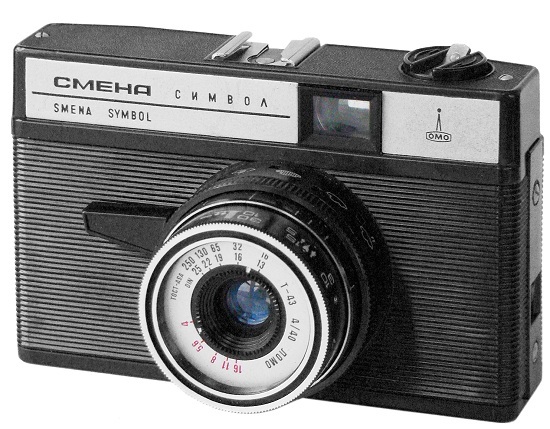 Camera identical to PK7360, but with serial number stamped on the bottom plate already. PK7360 - Smena Symbol #7343328. PK7375. 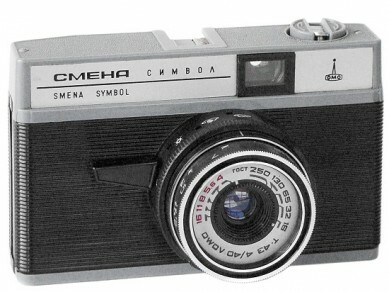 Very uncommon export version of Smena-Symbol camera. 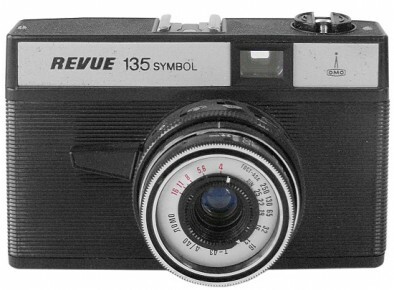 Comes under name "Revue 135 Symbol". Serial number stamped on the bottom plate already. Was intended for Germany market (c.1975). PK7375 - Smena Symbol #75887997. PK7380. Seems to be the rarest version of rebadged Symbol cameras. 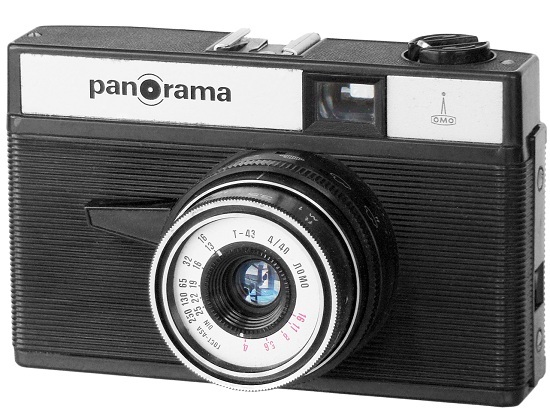 Comes under export name "Panorama". 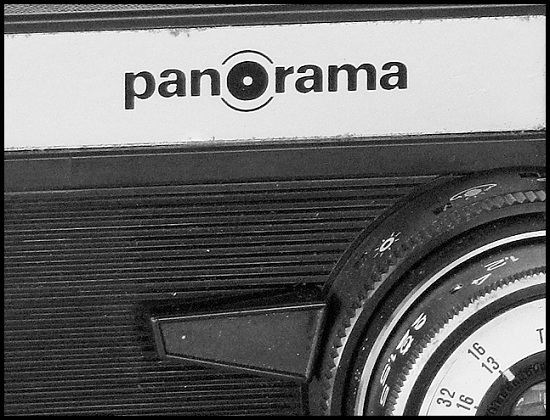 According to Luiz Paracampo sources, the "Panorama" trade mark belongs to the German mail sailing company OTTO. Very limited quantities released for France market. 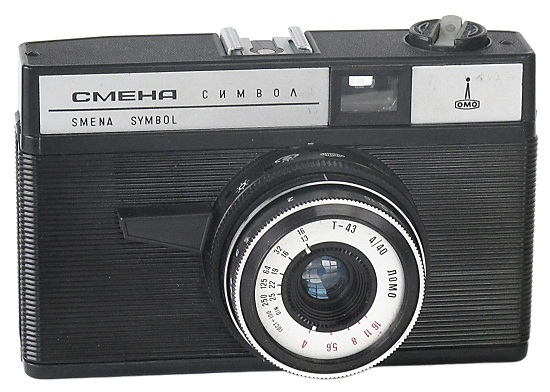 PK7380 - Smena Symbol #7410999.